Bumper to bumper and stuck behind the wheel of your car during rush hour, this twice-daily ritual seems never ending. You find yourself having to leave earlier only to sit in traffic longer. The average American will spend at least 50 minutes a day commuting to and from work. That doesn’t include the time we need to take our children to school, where we are driving to on the weekends, and all the times we partake in America’s favorite passion, the road trip. Now there is plenty of home theater technology available for you and your family to stay entertained while on the road. Often referred to as “ICE,” this is your vehicle’s in-car entertainment system. Most new cars from the major auto manufacturers come equipped with state-of-the-art ICE systems, but don’t worry if yours doesn’t. They are easily purchased and installed. You can have multiple screens in your center console and various other locations of your car. If a large console screen is too much for you, you can get the car stereo decks you may be used to that allows for various interface options. Every manufacturer in the car audio industry offers sound solutions that rival your home theater speakers. No matter the size of your automobile, it’s a controlled space that allows audio technicians to craft the ideal audio experience. There are even Bluetooth options for some speakers, so they can be placed any where in your car. If it’s listening to audio books during your commute or the family is watching movies, you can have that home theater sound on four wheels. Your phone is already coupled with your home theater system allowing you access to all of your favorite shows and movies. An ICE system allows for you to interface with your phone so you have your favorite programs with you on the road as well! Most smart phone apps like Netflix and Hulu can easily communicate with you car entertainment system allowing you to pick up where you left off on your sofa. There are a couple different options you can choose from with monitors. Your ICE console will act as a monitor and you can still place monitors in the back of head rests for passengers to view. 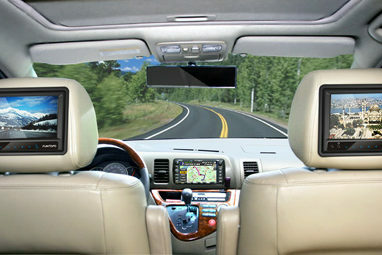 A screen can be placed in your car ceiling, lowering down when in use. There are dashboard and visor options for your front seat passengers as well. You always have the option to use tablets, communicating with your ICE system and each other creating even more entertainment options. Road trips are so much more fun when everyone is having a great time. Now you can take your family movie night and television time on the road with you. Building your home theater system for your car starts with the right apps. From there you can upgrade all of your automobile’s hardware to fight car boredom for your long commutes or family vacations. Contact Home Theater Systems today and we can help sync your home theater system with your smart phone today!